Yesterday, I talked about the value of selling individually valuable items using internet auction sites and classified listings. If you know something has significant individual value, you’re better off selling it individually, preferably directly to a buyer rather than through a middleman. However, a lot of the items we’ll find cluttering up our house have a relatively low individual value. A DVD of a movie that came out ten years ago. A baseball card of a player who never really made it. A box full of used tools. A game for a video game system that’s about to become outdated. These items are worth a few dollars on their own, but the time it would take to sell each of the items individually would easily overwhelm the extra income you might make. So, what do you do with that old comic book collection or that pile of old DVDs that you no longer watch? For those items, you have a couple of options. The first option would be to simply make an expanded list of the items for sale and put it on Craigslist. Say that you’re selling these items, stick a reasonable price on each one, and put the list out there. This is a very good way to clear out a DVD collection, for example. Success with this method is highly hit-or-miss, though. Sometimes, people won’t even get a nibble. Other times, you’ll get crazy emails wanting to know intimate details of the condition of the DVDs. Sometimes, you’ll sell off most of them. If you’re still holding items at this point, the best way to get rid of them is to sell them in bulk. Many cities have used entertainment stores that will buy most DVDs from you at various prices. 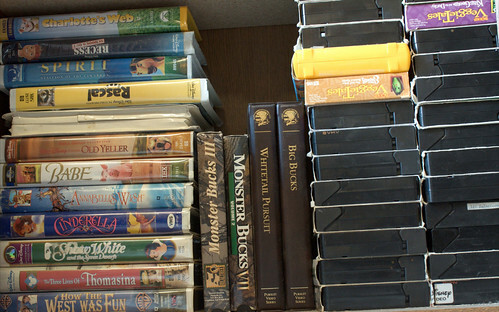 Other types of bulk entertainment items, such as comic books or records, will sell well at the appropriate niche shops. Another option is a straight-up pawn shop for items that don’t really fit with a specific niche. Be aware that when you go this route, you’re not going to get top dollar for your items. You’ll get a lower return, but your time investment in the items will be pretty low. For many people who don’t have other options available to them (such as yard sales, which we’ll discuss tomorrow) and have decided that the time investment in getting an extra dollar or two out of a particular item isn’t worth their time, this is perhaps the best option. There are a few tactics you can use to make sure you’re going to get the best return. First, make sure the items are in reasonably good shape. Don’t bring in items that are crinkled or dusty or covered with fingerprints. Wipe your items down with a cloth at least before you attempt to sell them. Second, don’t be afraid to negotiate. Many secondhand shops will allow you to negotiate what you get for the item. When they make an offer, make one in return that’s perhaps double what they’re offering, then come to an agreement somewhere in the middle. It’s good if you go in the door with an expectation of what you might get for your items. Finally, don’t be afraid to walk if they’re giving you very little. There are other places to sell your items, after all. You don’t have to take the first offer.